“That’s wonderful!” his mother says. “What part did they give you? “I’m the Jewish husband,” answers David. We may argue about whether this joke is more insulting to Jewish men or to Jewish women, but I think we can agree that it is a relic of the past, based on offensive stereotypes of Jewish women as overbearing and Jewish men as quiet, mousy types. The Jewish women I know are powerful and outspoken, but to me those are assets, not faults. And the Jewish men I know are not at all quiet… except, surprisingly, about Judaism. When it comes to Judaism – to Jewish life – more and more men today are absolutely, completely silent. A generation ago it was exactly the opposite. Temples were run by men, the rabbis and cantors were men, and women were relegated to “the girls in the office” and Sisterhood. In fact, very few Jews back then even gave their daughters a Jewish education – “she’s only a girl” was the most common explanation. Even in the early days of Rodeph Torah we had families who enrolled their sons but not their daughters. What’s going on here? Some people attribute it to a general decline in religious life in America, but if that were the case, why are parents still enrolling their daughters? My suspicion is that American Jews, relying on the experiences of their past, think that Judaism will happen as automatically for their sons as it did for them. But where did those automatic Jewish experiences come from? They came from grandparents who knew how to conduct a Passover seder, who insisted on and often paid for a Jewish education for their grandsons, and who made some kind of Shabbat observance part of their lives. So, who will be tomorrow’s Jewish grandparents? More to the point, who will be tomorrow’s Jewish grandfathers? Jon Stewart jokes that he’s not really Jewish, he’s more Jew-ish. That’s cute, but what does it mean? I know The Daily Show appears on Rosh Hashanah, Yom Kippur and Passover, and I don’t think he takes Friday off just so he can prepare for Shabbat. 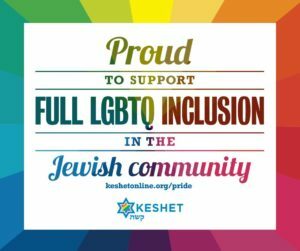 So what part of Jew-ish is Jewish – for him, and for other Jewish men? Passover brings this question to the forefront because it challenges us to “tell our children” – to tell the story, not just of the Exodus from Egypt, but of our entire history. But telling the story takes knowledge – and confidence, too. It takes a certain chutzpah to lead a seder. Where will that confidence – that chutzpah – come from for the next generation of Jews, and particularly of Jewish men? Will they be ready to take on the role of grandpa, of saba, of zayda? Will they be able to tell the story well enough for their children to listen and take on the challenge of Jewish life? In our area, it is possible to have someone slap a kippah on a 13-year old boy, say a few Jewish words over him and call him a Bar Mitzvah. It’s a free country, and people can do whatever they want here, whether it’s a good idea or not. But I wonder how many parents who choose that approach have given any thought to what their child will take away from the experience. Bar (or Bat) Mitzvah is a celebration of learning; what happens when it is only a celebration, without any learning? Years ago, before we liberal Jews made the haggadah more inclusive, we used to talk about the Four Sons: the wise son, the wicked son, they simple son and the one who does not know enough to ask. Maybe it’s time to return to this gender-specific question: will our Jewish sons know enough to ask?